After spending several hours on Friday taking in the beauty of Newport, RI, we started the journey back to our home base in Connecticut. 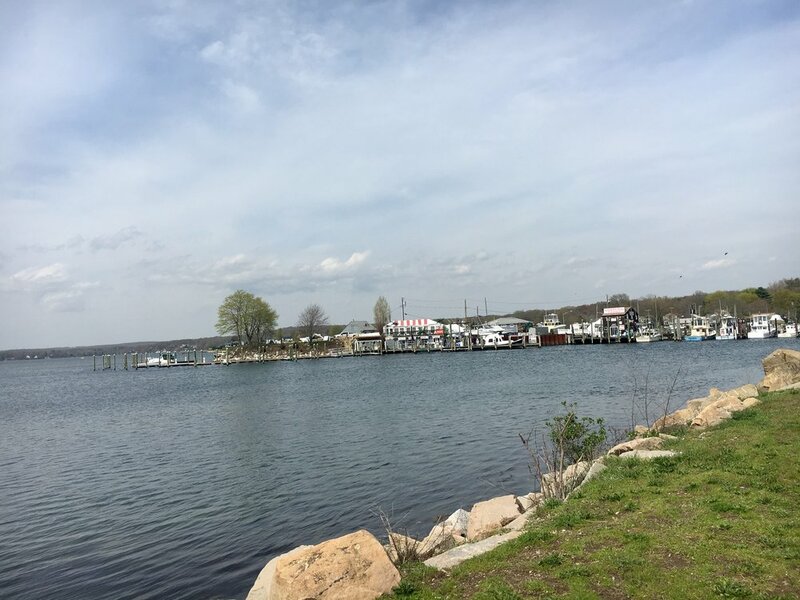 We had spent the past two days at destinations in the neighboring states of Massachusetts and Rhode Island, so we decided to stop and explore one of Connecticut’s many coastal towns. The Connecticut coastline is 96 miles long and borders the Long Island Sound. We had seen signs for the Mystic Seaport a couple of times along I-95, and we enjoy just about any coastline or body of water, so we decided to hop off the highway and take a look around. After we parked and made our way to the entrance of the Seaport, we then realized that it was only open until 5:00 PM . . . and it was already after 4:00 PM. Definitely not enough time for us to invest the entrance fee of $28.95 per person. Actually, regardless of what time it was, we most likely would not have spent almost $60 to gain access to the Seaport. We would have gladly walked around the waterfront as we’ve done in many places, but this area was safely protected by gates and fences. Since we were already off the highway, we decided to proceed about a mile further down the road to the downtown area of Mystic, CT. Since we’ve both been known to enjoy a good small downtown, especially one with a water element, Mystic seemed to be right up our alley. We parked and set off on foot through town. It was a collection of small shops and storefronts, with some restaurants mixed in. 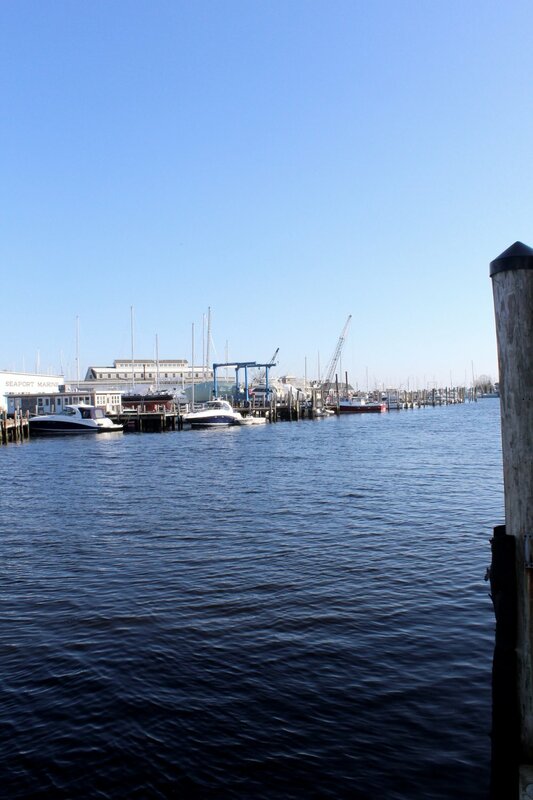 The Mystic River flows right through the center of town, and with access to the Long Island Sound, there were marinas and boat yards on both side of the river. The centerpiece of the main street was the Mystic River Bascule Bridge, which is another name for a draw bridge that utilizes counterweights to raise and lower the road surface. 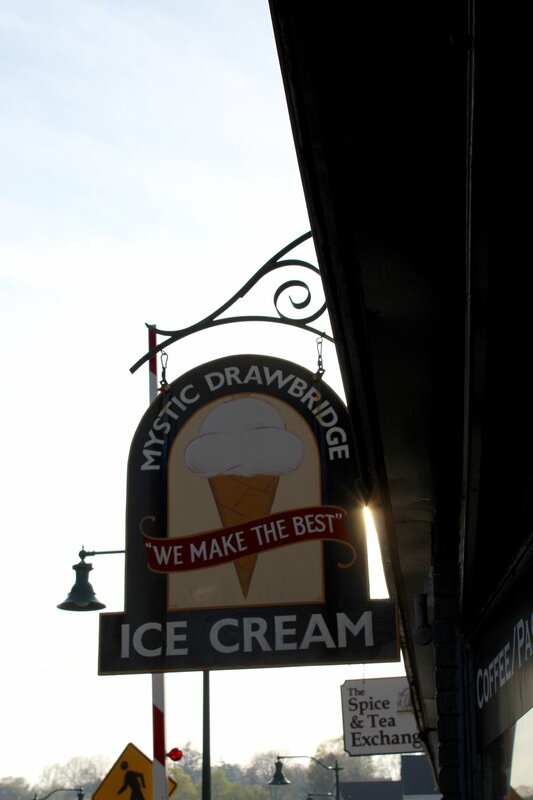 We strolled around the town, sat in a small park along the river, and discovered the Mystic Drawbridge Ice Cream shop, located right next to the bridge. A quick visit to a cute little town. We did not have much planned for Saturday, but the sun was shining so Betsy put her research skills to work and found us an outdoor activity. A short drive from the campground was the Niantic Bay Boardwalk. The boardwalk is 1.1 miles long, stretching from Cini Park and the railroad bridge on the east, to Hole-in-the-Wall beach on the west. It is billed as one of, if not, the nicest waterfront walkways in the entire state of Connecticut. With that kind of advanced billing we decided to give it a try. We parked in the free parking lot at Hole-in-the-Wall beach and headed out onto the boardwalk. The boardwalk was concrete and well maintained, with many benches along its path. The views were pleasant as we walked the route and commented on the people on the beach already and that the water would be a tad bit cold this early in the year. The boardwalk was a pleasant walk with nice views and provided us with a great excuse to get out in the spring weather. Connecticut’s bigger name neighbors may get more attention, but we enjoyed our visits to its coastline during our stay in the area.